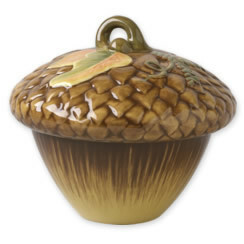 Pfaltzgraff Plymouth Large Acorn Covered Bowl MICROWAVE DISHWASHER SAFE Plymouth features embossed pumpkins, acorns and ears of corn on a warm, creamy white surface making it ideal for Thanksgiving or any autumn occasion. This unique shaped acorn bowl will have everyone going nuts, and imagine the look on a squirrel's face when he sees this great-looking bowl with realistic textural details. A festive touch to your tabletop. 19 oz., 6" high. MSRP 40.00 I will ship to the lower 48 states only. SORRY, NO US TERRITORIES, APO, FPO, POB, OR INTERNATIONAL. I do think green, so when ever possible I will recycle shipping materials. Since this item will be shipped UPS ground, I will need a physical address to ship to. I will ship only to the name and address listed on Paypal or Amazon. I f you need it shipped to an alternate name or address, be sure to update your payment method prior to payment. I am not a drop shipper, all items are inspected personally when I receive them and double checked prior to shipment to insure no chips, cracks, or breaks. Combined shipping available, see booth policies regarding combined shipping.